Item #DB-2866: 21.5" necklace of 5mm round Italian Red Coral beads with 14Kt. Yellow Gold fish hook clasp. 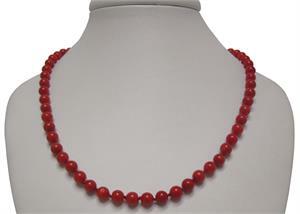 Item #DB-2865: 22" necklace of 4.5mm round Italian Red Coral beads with Gold-filled fish hook clasp. 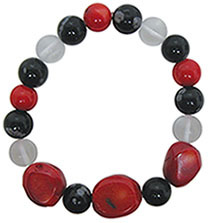 Item #DB-2876: 28" necklace of Italian Red Coral Branch beads with Sterling Silver lobster claw clasp. Item #CPBR-3: 18Kt. Yellow Gold brooch with 13x18mm oval carved Coral Cameo and fourteen round Diamonds of .42 Cts. TW. 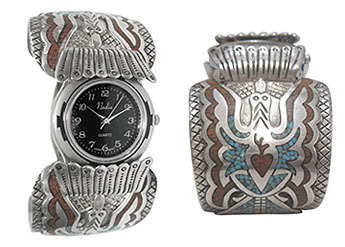 Item #SY-145-6Q: ESTATE PIECE - Nadia quartz watch with 1 5/8" wide Sterling Silver cuff with inlaid Coral and Turquoise. 86.48 grams TW. 2 7/8" inside diameter. 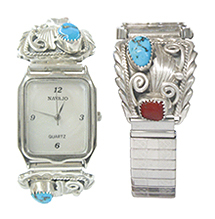 Item #SY-040610-2: ESTATE PIECE - Navajo quartz movement watch with 1" wide Sterling Silver band with pear shape Turquoise Cabs and rectangular Coral Cabs. 54.24 grams TW. Item #SC-ERCR-282: 14Kt. Yellow Gold earrings with 5x7mm oval medium pink Coral cabs, ten round Diamonds of .05 cts. TW bead set in White Gold and post & clip backs. Item #SC-EPCR-0033-X5-W: 14Kt. White Gold earrings with 10x14mm oval pink Coral cabs, rope trim and post backs. Item #SC-EFCR-0003-X6: 14Kt. White Gold earrings with 12x16mm oval pink Coral cabs, rope trim and post & clip backs. Item #SC-ERCR-279: 14Kt. Yellow Gold earrings with 5x7mm oval mottled pink Coral cabs and post & clip backs. Item #SC-ERCR-339: 14Kt. Yellow Gold earrings with 5x7mm oval Pink Coral cabs and post & clip backs. Item #SC-ERCR-0033-X5-Y: 14Kt. Yellow Gold Earrings with two 10x14mm oval Pink Coral Cabs; rope trim and post backs. Item #SC-EFCR-0001-X6: 14Kt. Yellow Gold Earrings with two 12x16mm oval Pink Coral Cabs; fluted trim and post & clip backs. Item #SC-EFCR-0002-X6: 14Kt. Yellow Gold Earrings with two 12x16mm oval Pink Coral Cabs; Post & clip backs. Item #SC-EPCR-0956-X3: 14Kt. Yellow Gold Earrings with 8x10mm oval Pink Coral Cabs; Post backs. Item #SC-EPCR-0001-X3: 14Kt. Yellow Gold Earrings with 7x9mm oval Pink Coral Cabs; Post backs. Item #SC-EPCR-0003-X3: 14Kt. Yellow Gold Earrings with 7x9mm oval Pink Coral Cabs; rope trim and post backs. Item #SC-EPCR-0002-X3: 14Kt. Yellow Gold Earrings with 7x9mm oval Pink Coral Cabs; fluted trim and post backs. Item #SC-EPCR-0003-X4: 14Kt. Yellow Gold Earrings with 8x10mm oval Pink Coral Cabs; rope trim and post backs. Item #SC-EPCR-0002-X4: 14Kt. Yellow Gold Earrings with 8x10mm oval Pink Coral Cabs; fluted trim and post backs. Item #16924: Lady's 14Kt. Yellow Gold Ring with bezel set 10x14mm oval Pink Coral Cab and rope trim; Size 6 3/4. Item #17108: 14Kt. Yellow Gold Lady's Ring with 10x14mm oval Pink Coral Cab; Size 7. (WEB #SS-1821) Rhodium-plated Sterling Silver Lady's Ring with 7x9mm oOval Pink Coral Cab; Size 7. Item #SC-PTCR-0414-X2: 14Kt. Yellow Gold Pendant with 8x10mm oval Pink Coral Cab. Item #SC-PTCR-0414-X3: 14Kt. Yellow Gold Pendant with 10x14mm oval Pink Coral Cab. Item #SC-PTCR-0006-X2: 14Kt. Yellow Gold Pendant with 10x14mm oval Pink Coral Cab and rope trim. Item #SC-PTCR-0004-X2: 14Kt. Yellow Gold Pendant with 10x14mm oval Pink Coral Cab. Item #SC-PTCR-0006-X3: 14Kt. Yellow Gold Pendant with 12x16mm oval Pink Coral Cab and rope trim. Item #SC-ENCR-0032-X1 : 14Kt. Yellow Gold Pendant with 12x16mm pear shape Pink Coral Cab. Item #SC-PTCR-0115-X5-W: 14Kt. White Gold Pendant with 10x14mm oval Pink Coral Cab and rope trim. Item #SC-EFCR-0724-X1: 14Kt. White Gold earrings with 10x14mm oval red Coral cabs, forty-four round Diamonds of .36 cts. TW and post & clip backs. Item #CRE-43: 14Kt. Yellow Gold earrings with 11x15mm oval red Coral cabs, round Diamonds of .43 cts. TW set in White Gold and post & clip backs. Item #SC-ERCR-560: 18Kt. Yellow Gold earrings with 14mm heart shaped oxblood red Coral cabs, forty-eight round Diamonds of 1.26 cts. TW and post & clip backs. Item #SC-PTCR-0348-X1: 14Kt. White Gold pendant with 10x14mm oval red Coral cab of 3.53 cts and twenty-two round Diamonds of .17 cts. TW. Item #SC-PTCR-1020-X1: 18Kt. White Gold pendant with 8.1x13mm oval red Coral cab & eighty round Diamonds of .35 cts. TW. Item #BK-COR-0811-23: 14Kt. White Gold dangle earrings with 11x15mm oval salmon Coral cabs of 12.50 cts. TW and lever backs. Item #CJ-KP13-789008: Sterling Silver Pendant with average 22-27mm long cushion Sponge Coral Cab. Item #CJ-KP13-789006: Sterling Silver Pendant with average 21-27mm long pear shape Sponge Coral Cab.